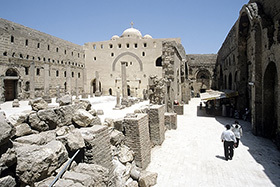 This ancient Coptic monastery is said to have housed 4,000 monastics, both male and female, within a few decades of its founding in the fifth century. The Church of St. Shenoute at the monastery is named after the second abbot who brought it to popularity while also instituting one of the largest literacy programs of his era. The library built up during and just after his time is said to have been one of the largest in the Christian world. After Arab occupation, the manuscripts more or less disappeared for centuries, before they began to be randomly purchased by European collectors in the eighteenth century. It took another one hundred years for the various collectors to realize they were amassing fragments of this one incredible library, and for scholars to begin putting the pieces of the ancient texts back together. The monastery has been repeatedly damaged and repaired across the centuries, including being burned to the ground in 1798 by Mamluks, so its current form is different than what it once was.